I was not quite sure what to expect, the company that produces them is eco friendly, which is good thing, a big tick there, the logs duly arrived in brown paper bags….no plastic used, another tick…..very solid, and smelling of …yes! 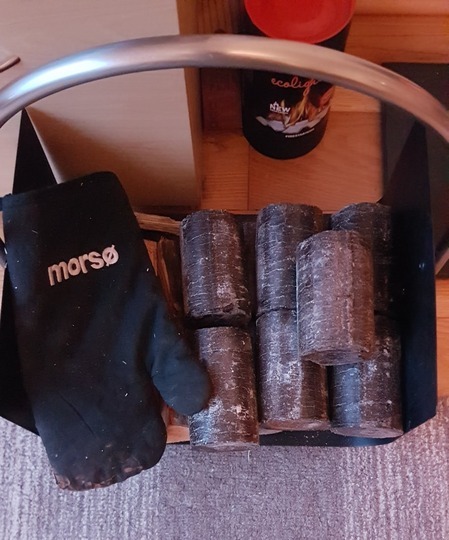 you guessed it….coffee.,..my OH was highly amused, although once on the fire the smell disappears very quickly…..they give out an incredible amount of heat…far more than ‘real’ logs…. The logs as you can imagine are not cheap, but effective, and burn with hardly any ash, which will then be sprinkled on our borders…. Thanks for taking the time to read this blog……. It's good to see inventive uses for our waste products. now that is interesting. I saw these for sale the other day and wondered how effective they are. glad they are as good as the info suggested. That's amazing! Very innovative and ecological too. Enjoy! Gosh how interesting,this site is brill,I am learning new things all the the time,thank you DD. New to me also, DD. Ingenious! Are they expensive? Neighbours have log burners ; we have an open fire. Wonder if "pele" would work on a log burner ; probably not with the word "log"! Hywel and Stera might have heard of "pele". 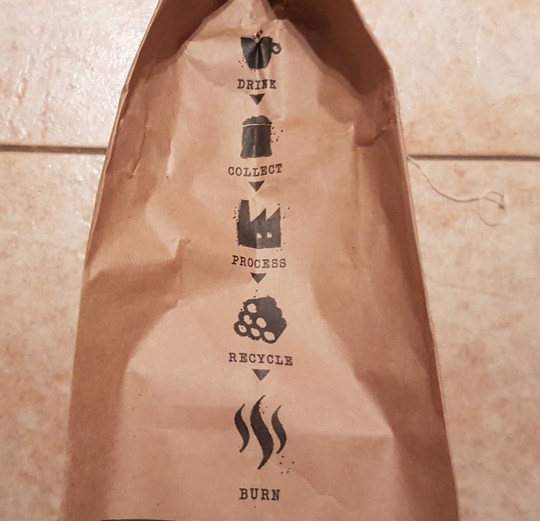 Gosh learn something new every day, wonder if that will stop the coffee shops giving away the used coffee grounds..
What a surprise! I bet you were quite excited when you burnt the first ones! Ah...I saw these at local GC. Next time I see them I’ll bring some home! Pele is small coal made into little balls Sue. 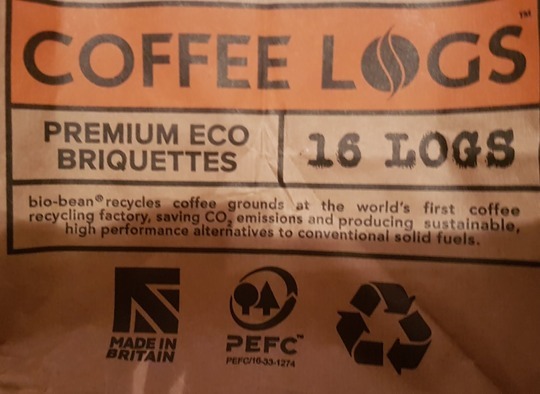 I’m both pleased and impressed that someone was enterprising enough to invent coffee logs. Perhaps if enough people buy and use them the cost will drop. Congratulations on finding them, Dot. 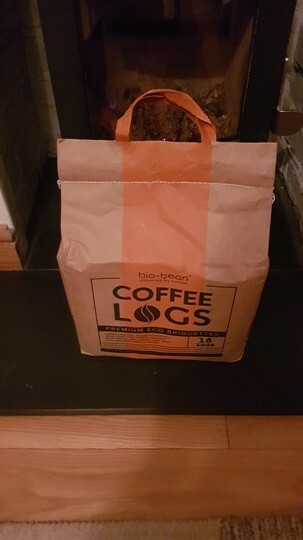 I had never heard of coffee logs but what a good idea! Have to see if our GC stocks them and try them out. I did a bit of googling and found another alternative to wood which is Brackettes. They are made from recycled bracken.I love a bit of enterprise. Thanks for posting this info dd. Karen if you do buy some, wait until the fire is well underway before you add the coffee logs, and two is plenty!! they are very hot! Wildrose I was secretly hoping they would give off a coffee aroma! Lincs our daughter has a. coffee shop, she brings the grounds home to use on the garden, but you soon run out of space, hers is only a small concern, the big companys are only happy to get rid of it! Eirlys they are expensive, and I would not recommend using them on an open fire! never heard of pele Hywel! Callie your welcome, happy to oblige! Stera I agree, nothing wasted! Seaburn they do the job intended, nice to handle attractive to look at, just a tad expensive! Hywel, Dawn, and Linda, thanks for your comments, good to see an eco friendly way to use a waste product, shame you cannot wake up and smell the coffee though!! What a great way to use up all those tonnes of coffee grounds! My youngest son used to run his own coffee shop in Cuenca, before coming over here 3 years ago. I must remember to ask him what he did with his coffee grounds. Most likely they went in the rubbish bin! ? What a marvellous thing technology is - I've just written to my son & asked what he used to do with his coffee grounds & - as I suspected - he just binned them! Though he does know they can be used like fertilizer for the plants in the garden as well as removing bad smells from places like sinks! One other thing he told me is that they can be used to attract a type of small red beetle!!! ??? ??? Balcony thanks for this information, will tell our daughter to look out for any red beetles, friend or foe Balcony? Lincs Lass : Spot on with the pronunciation! I don't know if they are friend or foe just that my son told me they like to hide in the coffee grounds! Right! let me know if you find out!! Cuenca is in Spain isn't it? the beetle probably isn't a native of Britain. but there are several red beetles and they are not all baddies. The red cardinal beetle is a native. I wonder how many get squished by mistake. They eat other insects so can be counted as friend.